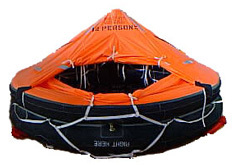 The ROARING FORTIES™ USL COASTAL life rafts are also made to last if proper maintenance & storage instructions are adhered to and they are available in various sizes from 12 person to 25 Person. These rafts (buoyancy tubes) are made from tough neoprene fabric (US Coast Guards Approved) and for the canopy we use polyurethane coated material. The latter is UV resistant.